Wow, I get to mention Jeff Beck again. The old dudes of rock are really making a statement this year, aren’t they? The inventive guitarists — who are popular the world over — both got their start with the Yardbirds in the ’60s. Though they never actually played together in the band, it was Jeff Beck that Eric Clapton recommended as a replacement after he quit the Yardbirds to join Jon Mayall & the Bluesbreakers. The two had such a good time playing together in Japan earlier this year that they’re going to reconvene for a London gig in 2010. The one-off show at London’s O2 Arena on February 13, 2010 will be the second time the guitar legends have played together in recent times. “I’ve always considered Jeff Beck to be one of the finest guitar players around. He’s a friend, a great guy, and a truly gifted musician. 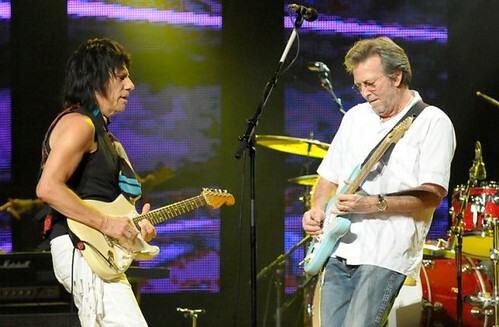 We had such a fun time in Japan that it seemed natural to play together again,” responds Eric Clapton. Each musician will play a set of their own music before pairing up to finish the show. This is the concert I would have attended if I wasn’t already flying to New York to see Pavement. Wait, never mind. This show is in England. Who can afford to fly there?